Last week on both RAW and SmackDown, Becky Lynch was interrupted by the Lady of WWE Lacey Evans. Lynch has now fired a shot at her next opponent on social media. Becky Lynch made history at WrestleMania 35 when she became one of the first women to headline the Grandest Stage of Them All along with Ronda Rousey and Charlotte Flair. Lynch ended up winning the match after pinning Ronda Rousey to leave WrestleMania 35 as both RAW and SmackDown Women's Champion. The following night, Becky Lynch made a heroic return to Monday Night RAW as a double champion. However, things didn't go exactly as planned with Lynch being interrupted by the 'Lady of WWE' Lacey Evans. It now looks like Lacey Evans has been earmarked as Lynch's next challenger. 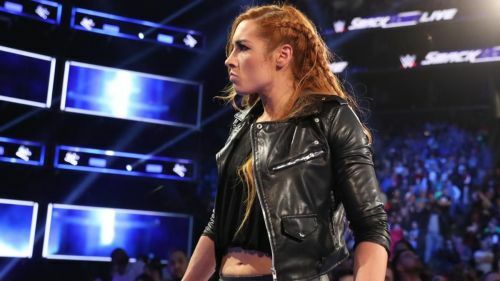 "And my actions are being talked about by the "history makers" themselves.... Good thing you're practicing bowing down, my high heels will need cleaning when I'm done taking everything you've worked for"
It looks pretty clear that Becky Lynch's first feud as the RAW and SmackDown Women's Champion will be against Lacey Evans. We don't yet know which brand Evans will officially end up on, which will be confirmed during the Superstar Shake-Up that begins tonight.